White, also fire chief, 'was a huge asset to our community," Town Manager Shiloh LaFreniere said Sunday. Jay police and fire chief, Larry White Sr., died Sunday morning. He was diagnosed with pancreatic cancer several months ago. White passed away at his home, where his family had been caring for him, according to Jay Town Manager Shiloh LaFreniere. LaFreniere said White started treatments for the cancer in January and stopped working in February. White had worked at the police department since 1987, starting as a patrolman, according to LaFreniere. He became chief in 2002. He also was fire chief, she said. Before coming to Jay, he worked at police departments in Livermore Falls, Lewiston and Sabattus, as well as at Androscoggin County Sheriff’s Department, according to LaFreniere. White has a wife and children, and he had hoped to make it to his granddaughter’s wedding on Saturday, but was too ill to attend, LaFreniere said. “It’s been hard on the family,” she said. The police department has eight full time officers, as well as reserves; the fire department has between 30 and 40 volunteer firefighters, she said. 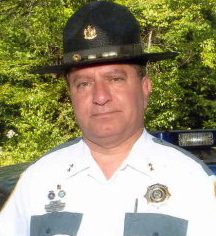 Richard Caton has been serving as acting chief, according to LaFreniere. Last month, the town dedicated a live Christmas tree in front of the police department to White. White attended, as did selectmen, firefighters, police officers, town office employees and residents. “It is with great sadness that we announce the passing of our courageous leader, Chief Larry White Sr. He fought a hard battle against an evil cancer with countless people standing behind him.